Fighter jets have targeted forces under the command of Libya’s renegade General Khalifa Haftar in a bid to halt his military assault on the capital, Tripoli, that threatens to further destabilise the country. As clashes continued on the outskirts of the city on Saturday, human rights groups warned of civilians suffering possible abuses if the fighting escalated, joining a chorus of international powers calling for a cessation of all hostilities. Haftar’s self-proclaimed Libyan National Army (LNA) said in a statement on Saturday it was carrying out an operation to secure Tripoli’s former international airport, which sits some 30km south of the city, and would later use it as a launching point for missions aimed at seizing key sites within the capital. Al Jazeera’s Mahmoud Abdelwahed, reporting from Tripoli later on Saturday, said that high-ranking GNA officers “confirmed they are in full control” of the airport. “In fact, as they say, they are pushing back Haftar’s forces from the outskirts of Tripoli towards the city of Gharyan,” he added, referring to a city south of the capital that was taken by the LNA on Thursday. The wrestle over the airport comes two days after Haftar ordered the eastern forces to march on Tripoli, which is controlled by the United Nations-backed Government of National Accord (GNA) and protected by an array of militias. The LNA is allied to a parallel administration based in the east of the oil-rich North African country. Al Jazeera’s Abdelwahed said the area surrounding the airport and a clutch of other nearby neighbourhoods were “witnessing military deployments and sporadic fighting”, accounting for one of four “major confrontation” zones. “These areas are on the southern outskirts of Tripoli, near the western gate of Tripoli … and two major front lines in the west of Libya,” Abdelwahed said, adding clashes could erupt in each of the locations “at any time”. The LNA’s advance has escalated a power struggle that has splintered Libya into a patchwork of the competing power bases since the overthrow of former leader Muammar Gaddafi in 2011. In response to Haftar’s drive, the GNA has authorised air attacks against “any military activities by [LNA] forces trying to enter the capital”, Abdelwahed said. Pro-GNA forces have also amassed in the city in a bid to push back the LNA offensive, with military units and detachments arriving from cities such as Misrata and Zawiya, Abdelwahed added. “We are getting reports from the eastern outskirts of Tripoli saying that more military units and detachments from Misrata are joining the battle, moving towards the southern outskirts of Tripoli,” he said. As fresh fighting between the competing factions flared, LNA forces alleged they had been targeted by four air raids, including one in the al-Aziziya region, which sits about 50km south of the capital. “Any jet fighter flying over Tripoli will not be allowed and will be targeted, the air base it came from will also be targeted,” Haftar’s spokesman, Ahmed al-Mesmari, said. He added that no LNA troops were injured in the raids. Amid the escalating tension, an array of international leaders and organisations have called for all parties to put an end to the ongoing conflict and instead focus their efforts on planning elections to resolve Libya’s prolonged instability. On Friday, UN Secretary-General Antonio Guterres said he was “deeply concerned” over the possibility of “bloody confrontation in and around Tripoli”. “The UN is committed to facilitating a political solution and, whatever happens, the UN is committed to supporting the Libyan people,” Guterres said. Guterres’s comments came as he wrapped up a visit to Libya, aimed at helping organise a national reconciliation conference planned for later this month. The UN envoy to Libya, Ghassan Salame, who is set to meet GNA head Fayez al-Sarraj in Tripoli on Saturday, said he was determined that the conference scheduled for April 14-16 would be held on time. In a televised speech on Saturday, Sarraj vowed to remain “firm” in the face of Haftar’s offensive and stated the reconciliation meeting offered the only way out of Libya’s political crisis, Abdelwahed said. In a statement on Saturday, Human Rights Watch warned that civilians could be caught in the middle of fighting. “Armed groups loyal to both sides have a record of abusing civilians,” the rights group said, adding that LNA fighters “have a well-documented record of indiscriminate attacks on civilians, summary executions of captured fighters, and arbitrary detention”. The statement noted that militias affiliated with the GNA and based in western Libya “also have a record of abuses against civilians”. HRW’s caution came after the G7 – a bloc comprised of the United States, Canada, France, Germany, Italy, Japan and the United Kingdom – issued a statement on Friday saying there was “no military solution to the Libyan conflict”. “We strongly oppose any military action in Libya. Any Libyan actor or faction that precipitates further civil conflict are harming innocent people and standing in the way of the peace that Libyans deserve,” it added. Meanwhile, after a closed-door emergency meeting in New York, the UN Security Council urged Haftar’s forces to halt their advance and warned that those responsible for reigniting conflict would be held responsible. The appeal was unanimously backed by the council, including Russia, which has previously supported the 75-year-old. 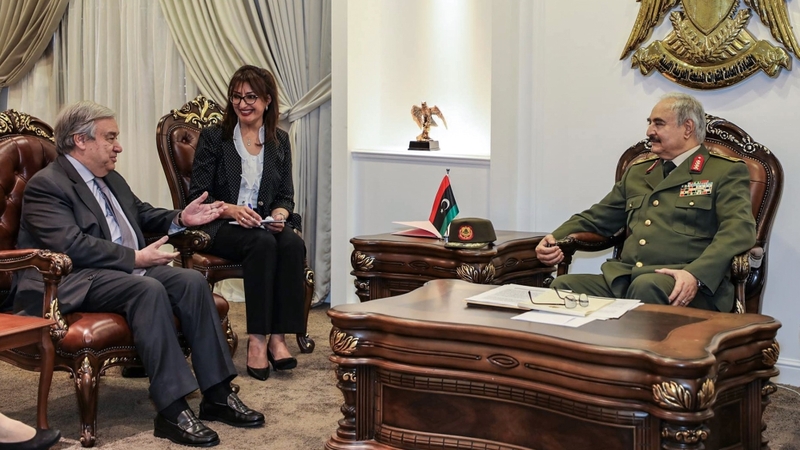 The council “called on LNA forces to halt all military movements” and “on all forces to de-escalate military activity”, said German Ambassador Christoph Heusgen, who holds the council’s presidency. But analysts speculated that the LNA chief’s move might in fact be an attempt to “shift the power balance” ahead of the reconciliation conference in a bid “advance his demands”. “Negotiations, at the end of the day, are reflections of power on the ground,” Ibrahim Fraihat, an associate professor in international conflict resolution at the Qatar-based Doha Institute for Graduate Studies, told Al Jazeera.